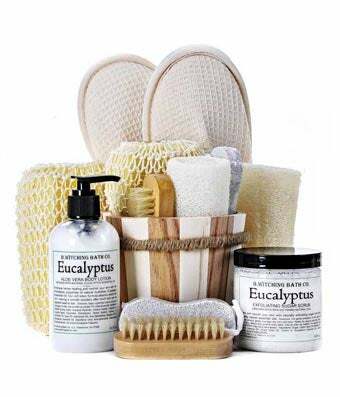 Send a sweet gift for a special occasion with this Organic Eucalyptus Spa Gift Basket. Delivered in a wooden basket this gift includes a Eucalyptus Body Lotion and Eucalyptus Sugar Scrub. Paired with the Eucalyptus gifts are a variety of spa essentials including slippers, a washcloth and more.